In this study, a high-precision distributed wireless microseismic acquisition system has been designed for oil and gas exploration. The system design, which was based on the ADS1274 chip manufactured by TI, made full use of the four channels of the chip to collect vibration signals in three directions and one electrical signal, respectively. Furthermore, the acquisition system used GPS and WIFI technologies to achieve distributed wireless acquisition. In this study, we propose a more accurate method for calculating the current velocity from the nanovolt-scale current-induced electric field as measured using an expendable current profiler (XCP). In order to confirm the accuracy of the proposed data processing method, a sea test was performed, wherein ocean current/electric field data were collected from the sea surface to a depth of 1000 m using an XCP. 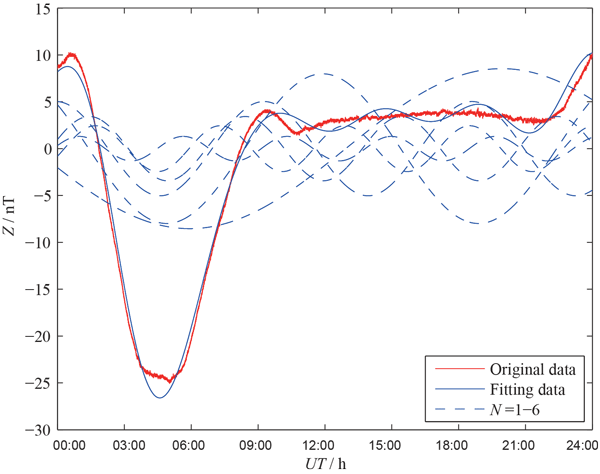 A fast Fourier transform was applied to fit the geomagnetic diurnal variation. Fitting results showed that when the polynomial degree was greater than 160, the residual error was close to 0 nT. White noise is the main component of the residual error when the polynomial degree was greater than 160, so this method was adopted to calculate the background noise of the geomagnetic field. Spectrum analysis further demonstrated the necessity to remove background noise from geomagnetic data. A new approach, based on the MRB magnetic field measurements radiated by two fixed and spaced RTI three-component magnetic field receivers and the solution of the inverse problem using these measurement results, was proposed and the concept of the MILES equipment for MRB search and localization was developed and successfully tested. The increase in the accuracy of the electric field measurement can significantly improve the quality of MT data. The paper deals with the peculiarities of the development of a new version of the instrument for the measurements of electric fields at MT – both electric field sensors and the electrometer. The results of experimental tests of the new sensors and the electrometer included as a unit in the long-period magnetotelluric station LEMI-420 are given. Chen, G. Y., Deng, M., Jin, S., Wang, M., Wu, C. X., and Zong, F. Y.: Design of embeded human-machine interaction system of borehole-to-surface electromagnetic transmitter, Progress in Geophysics, 31, 2319–2325, https://doi.org/10.6038/pg20160560, 2016 (in Chinese). 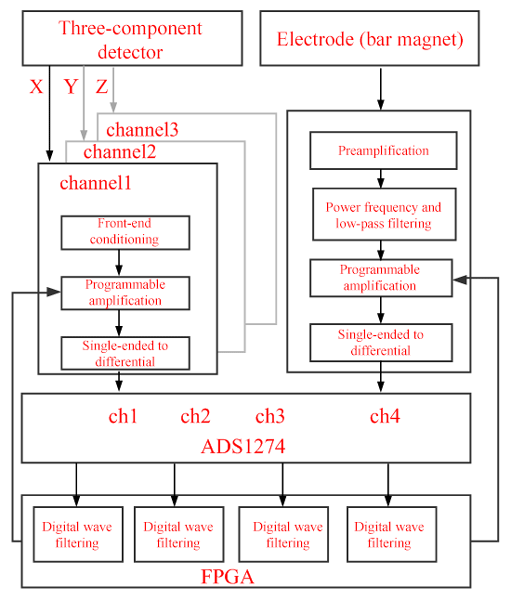 Chen, K., Jin, S., and Deng, M.: Multifunction waveform generator for EM receiver testing, Geosci. Instrum. Method. Data Syst., 7, 11–19, https://doi.org/10.5194/gi-7-11-2018, 2018. Coïsson, P., Telali, K., Heumez, B., Lesur, V., Lalanne, X., and Xin, C. J.: Time-stamp correction of magnetic observatory data acquired during unavailability of time-synchronization services, Geosci. Instrum. Method. Data Syst., 6, 311–317, https://doi.org/10.5194/gi-6-311-2017, 2017. Daniels, J. J. and Dyck, A. V.: Borehole resistivity and electromagnetic methods applied to mineral exploration, IEEE Geosci. Remote, 22, 80–87, 1984. 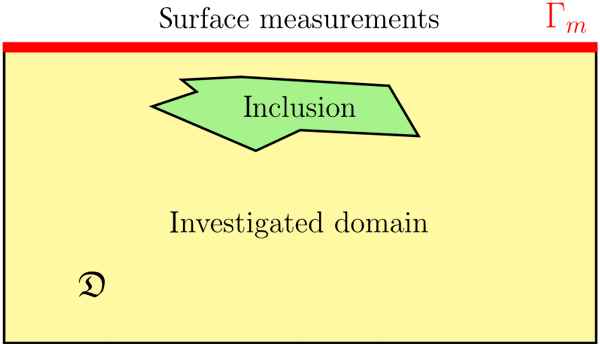 Deng, M., Li, Z., Wei, W. B., Tan, H. D., Jin, S., and Deng, J. W.: Seafloor magnetotelluric synchronous acquisition technology with far reference measurement method, Geology and Prospecting, 39, 77–80, 2003. Geng, Q. L.: The latest multifunctional electromagnetic instrument and its development trend at home and abroad, Equipment for Geotechnical Engineering, 17, 26–29, 2016. Jin, S., Zhang, L. T., and Wei, W. B.: Magnetotelluric method for deep detection of Chinese continent, Acta Geologica Sinica, 84, 808–817, 2010. Johnson, I. M.: Spectral induced polarization parameters as determined through time-domain measurements, Geophysics, 49, 1993–2003, 1984. Liu, L. X., Liang, Z. S., Liang, H. Q., Yin, H. D., and Liu, Y.: A study on current stabilization technology of transmitter for controlled-source frequency electromagnetic sounding, in: the Tenth International Conference on Electronic Measurement & Instruments (ICEMI), Chengdu, China, 16–19 August 2011, 357–360, 2011. Marshall, D. J. and Madden, T. R.: Induced polarization, a study of its causes, Geophysics, 24, 790–816, 1959. Sandberg, S. K. and Hohmann, G. W.: Controlled-source audiomagnetotellurics in geothermal exploration, Geophysics, 47, 100–116, 1982. Wang, M., Deng, M., Jin, S., and Wu, K.: High-power Pit(Well)-Ground electromagnetic automatic sweep frequency transmitter used for exploration of metal mine, in: 2011 Third International Conference on Measuring Technology and Mechatronics Automation, Shanghai, China, 6–7 January 2011, 332–335, 2011a. Wang, M., Deng, M., Jin, S., and Wu, K.: The borehole-ground controlled source electromagnetic signal transmitter, in: 2011 International Conference on Electric Information and Control Engineering, Wuhan, China, 15–17 April 2011, 1782–1785, 2011b. Wang, M., Jin, S., Deng, M. Wei, W. B., and Chen, K.: Multi-function electromagnetic transmitting system for mineral exploration, IEEE T. Power Electr., 33, 8288–8297, 2017. Wei, W. B.: New advance and prospect of magnetotelluric sounding (MT) in China, Progress in Geophysics, 17, 245–254, https://doi.org/10.3969/j.issn.1004-2903.2002.02.009, 2002 (in Chinese). Zhang, Q. S., Deng, M., Luo, F., Qiao, D. X., and Chen, K.: Circuit drivers of signal-acquiring unit in seafloor magnetotelluric system, Progress in Geophysics, 31, 1845–1851, https://doi.org/10.3969/j.issn.1004-2903.2004.04.015, 2004 (in Chinese).